Nautilus submarine paper model from the famous novel by Jules Verne (1870) "Twenty Thousand Leagues Under the Sea" which tell a science fiction story about exploring the depth of the ocean. This reptile like sub is designed and commanded by Captain Nemo. 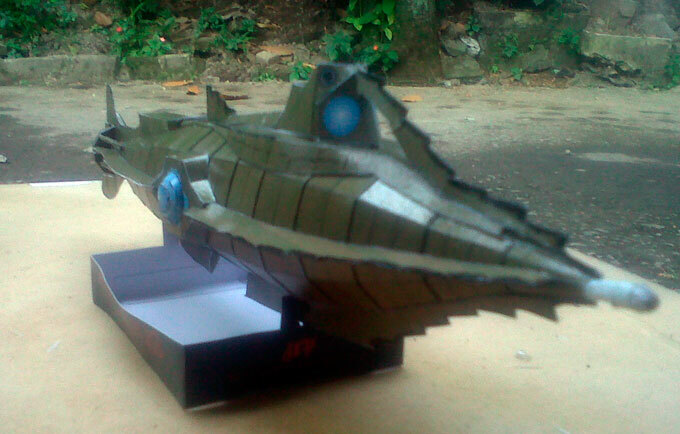 This is the second submarine that Dani made it into paper model as far I know. The first one was a nuclear submarine from the movie "The Hunt for The Red October" which was not shared for free, he made it specially for his friend. You may have known about this fact that we know more about the surface of the moon compare to our knowledge about the depth of the ocean, what lies beneath it. We still have to explore more into the ocean. Deep sea is 300 times larger than Earth's habitable land. I have an illustration about why we need to explore the ocean below. This interesting image link was sent to me by Caroline from Master Degree design team.